My wife and I purchased. A Vaporfire 100 last December and started using it the first week of January earlier this year (2018). I just got home from work it is 12 outside and 70 inside. The furnace was filled at 7 am it’s 4:30 pm now. The heat setting on the furnace is set at 1 and thermostat on 70. My parents and I have heated with wood for 40 years so this isn’t my first time doing this. This heating season we will be using poplar again. It has been in our wood shed for a year or more so it is very dry/seasoned firewood. This stove always has a good bed of coals when it’s time to refill, which is every 8-9 hours. Even with a softwood like poplar. The ash is like powder in the ash tray, which I empty every 4-5 days. Last week I cleaned the chimney; if you could call it that. There was nothing in the flute at all, just carbon powder. No creosote at all. Which tells me this stove is doing exactly what the owner and advertising says it does. There is little to no smoke, only 15 minutes or so after fill up. If you are looking to heat your residence with the most efficient clean burning wood furnace on the market look no further! You will be very impressed, we are. 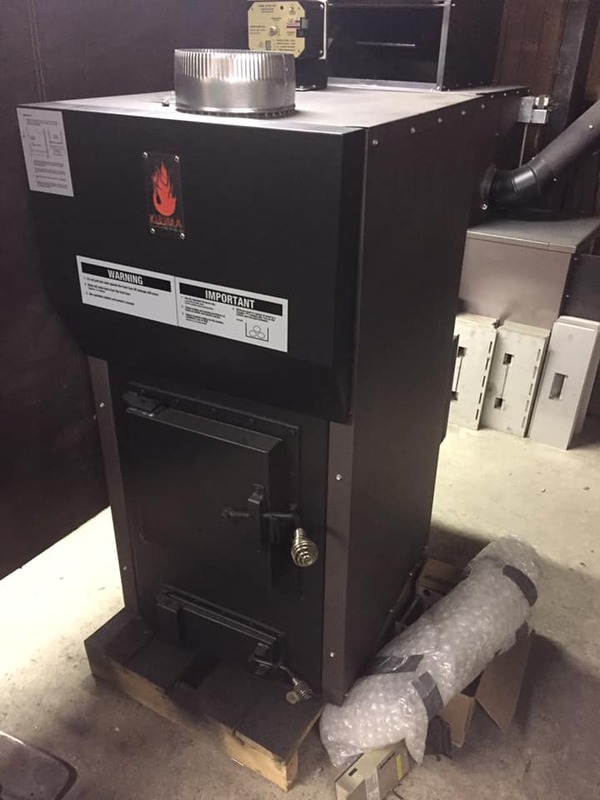 I like this furnace so much I tell everyone about it plus I will be putting one in my 32 x 64 shop as the primary heat seat source. This stove is three times the wood furnace it replaced last January. Here in northern Minnesota where there is often a solid week or two where it never gets above 0 F and -30+ at night this furnace has absolutely no problem keeping our 2 level 1700 sq ft home at a constant 68-72 degrees. Remember that’s on level 1 out of 8. On a closing note I will report on my wood use for a whole heating season here, of which the furnace has been in operation since mid October. I am sure we will use less than the other furnace plus keeping the house at a constant temperature now that winter has settled in for next 5 months. One last thing. We picked our furnace up ourselves at their manufacturing faculty. Great people to talk to both in sales and in the shop!